If you’re looking for unique and memorable gifts, you’ll always find them in small businesses, and shopping small is a wonderful way to support the local economy. It used to be that in order to shop small, you had to visit brick and mortar stores and while you can still do that if you like, many small businesses offer the comfort and convenience of shopping online. I do all of my holiday gift shopping online now — every single bit of it, and most everything comes from smaller merchants. They carry the hidden treasures that launch holiday gifts from returnable status to ooh aah unforgettable. 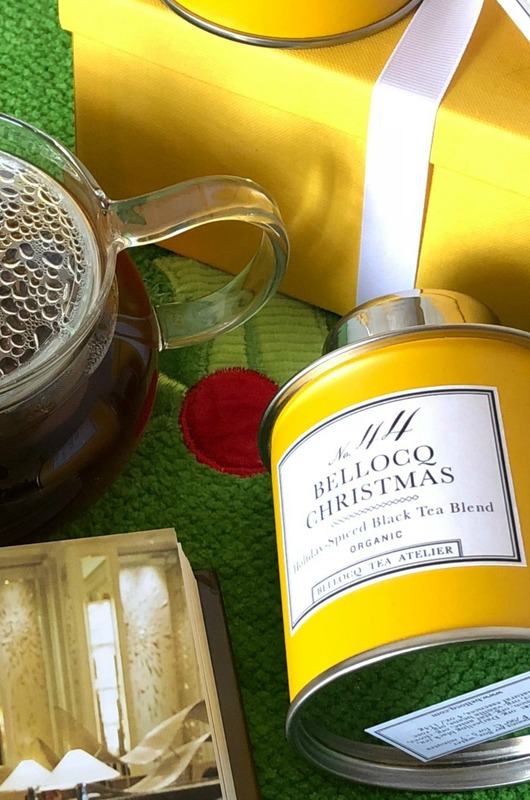 One of my favorite new discoveries is Bellocq – a tea atelier with “beautiful custom tea blends, fine full leaf pure teas, charming tea gifts and tea accessories”. 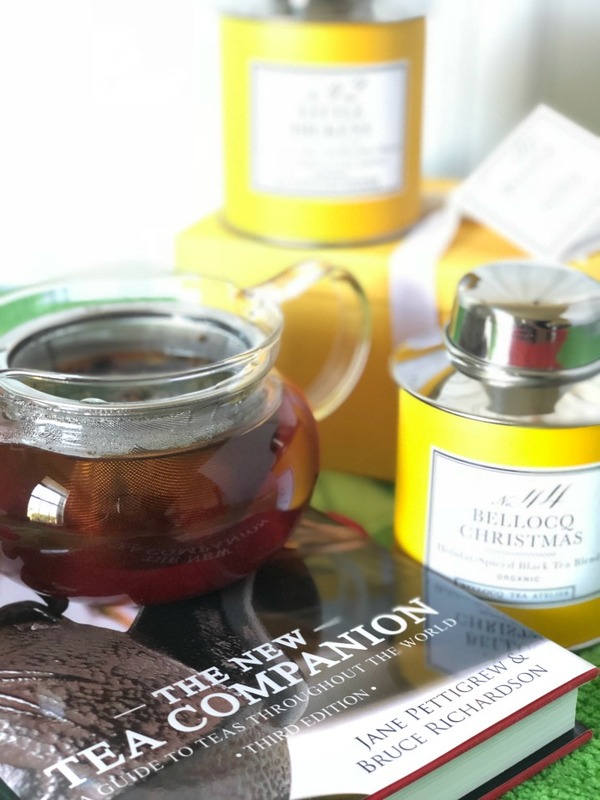 I was looking for a holiday gift set to break out on Christmas morning and I found exactly what I wanted at Bellocq. 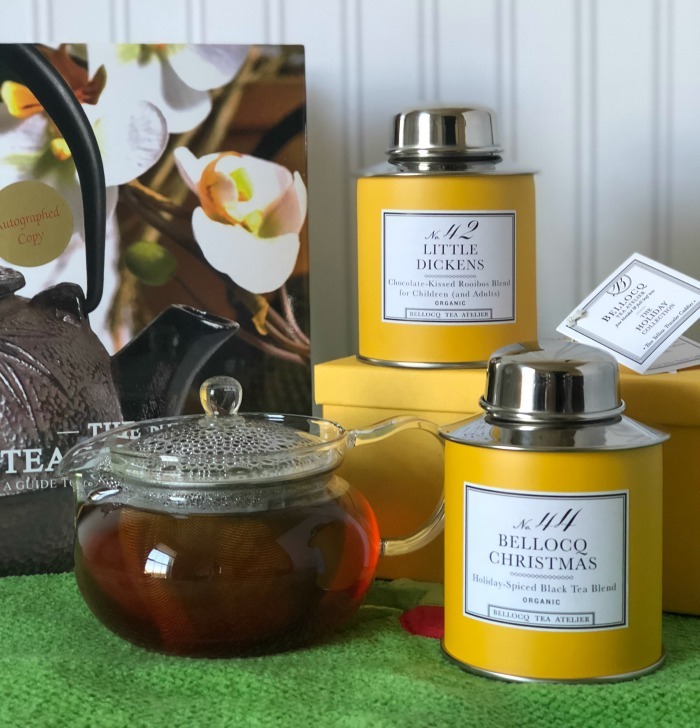 The beautifully wrapped loose leaf tea set is lovely enough to give on its own, but I couldn’t resist adding The Tea Companion and a glass teapot for the ultimate gift. 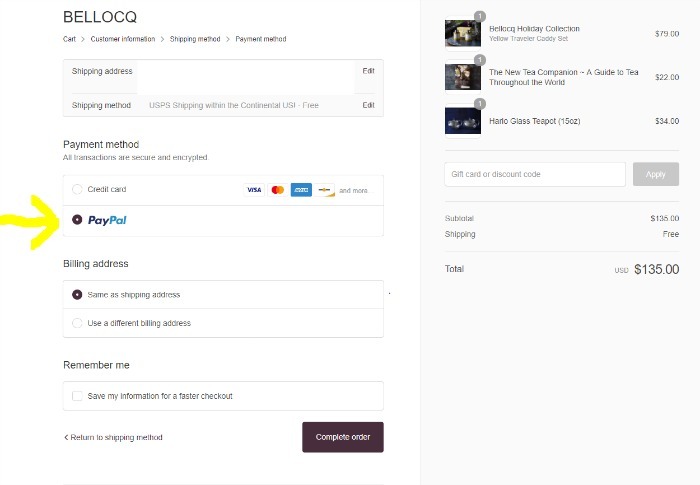 Once my online shopping basket was ready, I reached for my wallet and credit card but then spotted PayPal as a payment choice. YES! Since I use PayPal One Touch, I can pay without having to enter credit card or billing details, and I love knowing that even if a merchant doesn’t offer return shipping, PayPal’s Return Shipping On Us offers up to $30 per order in return shipping refunds and it can be used on 12 orders per calendar year. 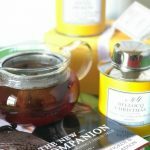 In this case, I love everything I ordered from Bellocq, so I won’t be returning a thing! Shopping small businesses with PayPal makes holiday gift giving practically effortless. You’ll be checking names off your list in no time. Have fun! Ever since moving down south to North Carolina where snow is a rarity, I’ve had a much harder time getting into the holiday spirit. See, I’m originally from Michigan, where winter is synonymous with snow. Lots of snow. Whenever Christmas Eve hadn’t been snowy, I’d wake up and hurry to the window to make sure my white Christmas had arrived overnight. On the rare years it didn’t, I was totally let down. Here in North Carolina, it’s a letdown every year. Boo! But I’ve found a few strategies that help me get into the holiday spirit even when there’s no snow in sight. The other day I noticed that my personal favorite, The Year Without a Santa Claus, was available on Amazon Prime. I decided to put it on while I did some things around the house and the cheery songs brought back memories and made me smile (despite having the flu, ugh). Some people might say it’s too early to be getting into the holiday spirit…but Scrooges can’t get me down. This might be my favorite tip. You know how there are just certain foods and drinks that remind you of the holidays and make you feel cheery? 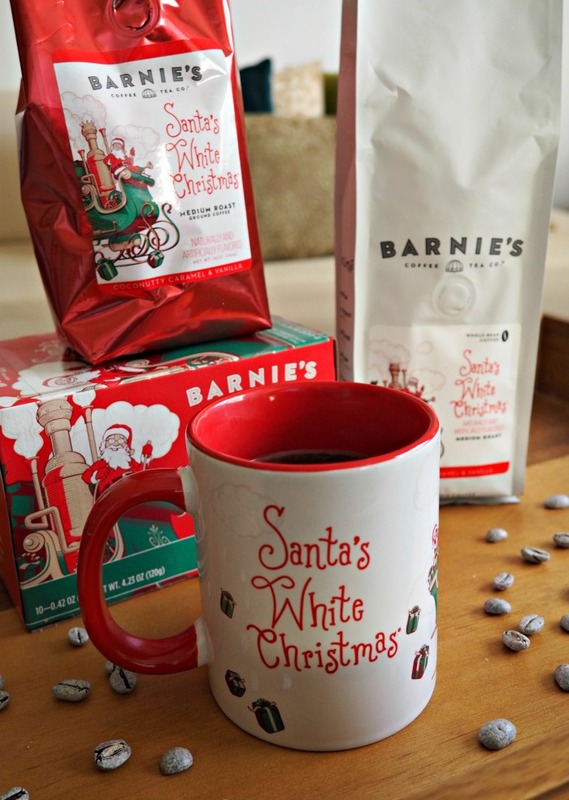 Whether it’s gingerbread, latkes, or a special treat that you usually stuff stockings with, like Barnie’s Santa’s White Christmas blend coffee, what’s the harm in cracking into them a little early this year? 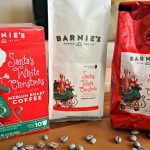 Barnie’s White Christmas blend is a festive coffee blend with coconut, caramel, and roasted nut flavors and comes pre-ground, as whole beans, and in K-cups so there’s something for every type of coffee drinker. Why not grab a box of K-cups to spread cheer at the office throughout the month, or pick up a bag of whole beans to give your French press-loving friend next time you see them? The first time I tried Santa’s White Christmas, I went for the bag of ground coffee and used it in my pourover coffee maker. It brewed beautifully and actually, it was what I was drinking while I watched the movie I mentioned above! It was nutty, smooth, and with a hint of sweetness — a welcome change from the espresso blend I usually use. It felt decadent without even needing to add cream or sugar. I also opened up the bag of whole beans and was delighted to see that they’re not just plain brown beans; they’re dusted with white as if covered with a light layer of snow. You can see some of the beans sprinkled about in my photos. Barnie’s has been around for 37 years, and all their coffees are crafted with high-quality beans. They offer plenty of other unique and flavorful coffee blends besides Santa’s White Christmas and have become a go-to for flavored coffees. 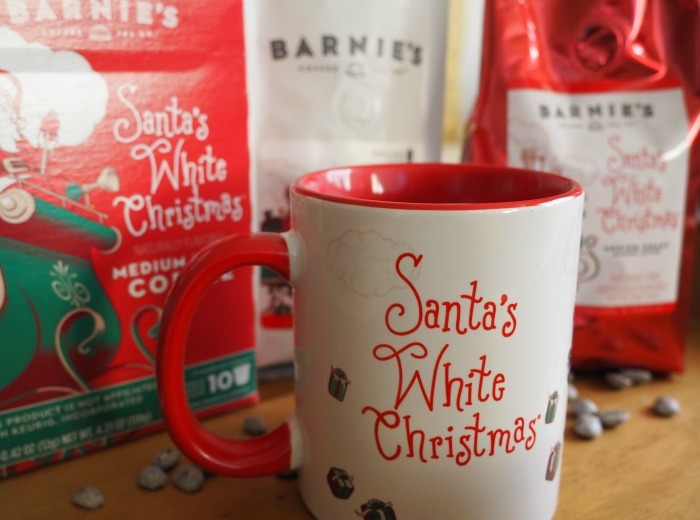 You can purchase Santa’s White Christmas from the Barnie’s website here, and get 30% off with the code EATMOVEMAKE30. I love thinking about my family members’ faces when they open my gifts, so getting ahead on my gift shopping puts me right in the spirit! 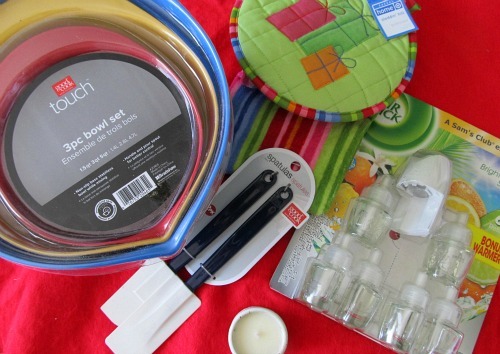 Check out this post for our best holiday gift shopping tips. While you’re shopping, take a few minutes to walk through the holiday aisles. All the sparkle and festive scents might boost your mood and heighten the holiday cheer. And don’t forget the candle aisle — holiday candles with scents like balsam or cinnamon might do the trick too. 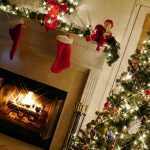 I hope these tips have helped get you into the holiday spirit, especially if you live in a warmer climate like I do where a White Christmas is merely a dream, *sigh*. 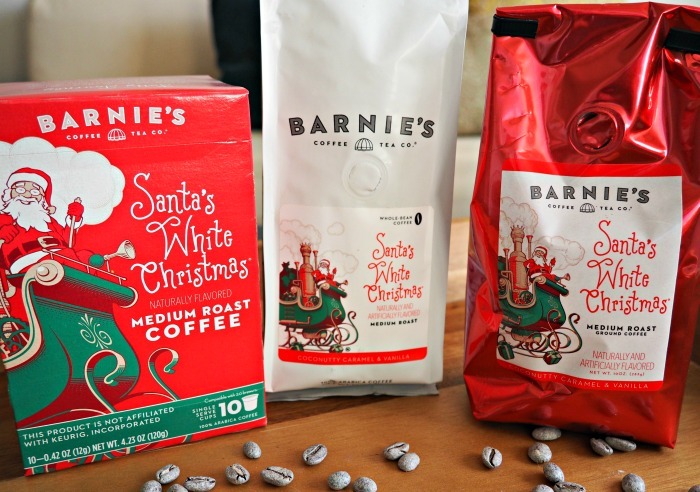 And don’t forget, if treats are your chosen method for boosting holiday cheer, you can get 30% off your Barnie’s coffee purchase with code EATMOVEMAKE30! I enjoy baking my family’s favorite holiday treats at this time of year, including these amazing Caramel Candy Bar Cookies. 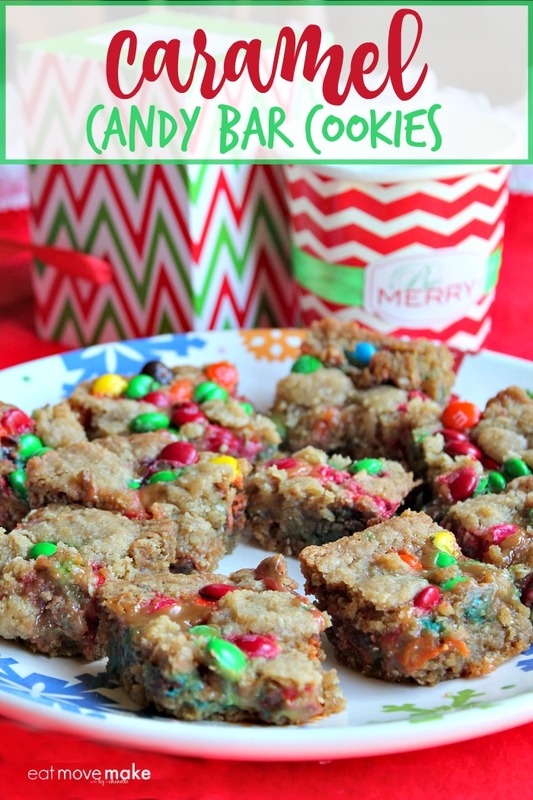 They’re a bit of cookie and a bit of candy in a single dessert. We love them, and I’m happy to be partnering with the National Candy Association to talk about enjoying confections like this in moderation. Candy has always been a part of our holiday traditions. When we put our Christmas tree up, we have a candy cane scavenger hunt before hanging them on the tree, and I’m definitely part of the 85 percent of Americans (according to the NCA) who give sweet treats for gifts. 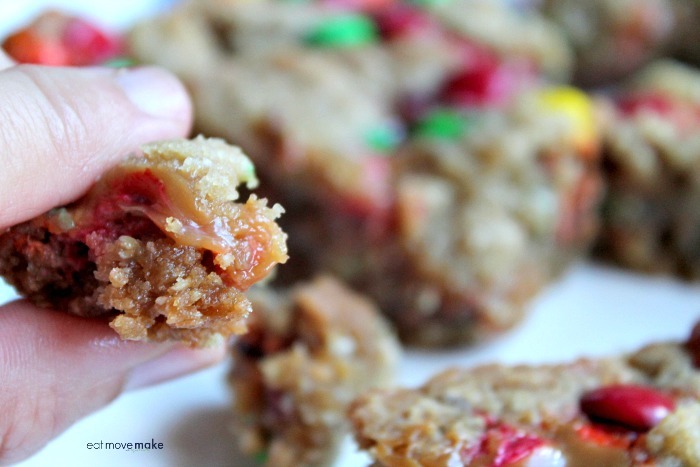 As with everything in life, candy and treats should be enjoyed in moderation, so when I make these caramel candy bar cookies, I cut them into very small pieces. I’ve always found that the first bite of any food is the most satisfying bite, so small servings are the way to go! Oh, and my candy cane Christmas tree tradition? Well, the candy canes are free for the taking once they’ve been put on the tree, but only at a one-a-day rate. A traditional peppermint candy cane (which is what I use) is only 55 calories, so it’s another great way to enjoy seasonal sweets in moderation. Heat oven to 350 degrees. Spray 13 x 9-inch pan with cooking spray. Combine brown sugar and butter; beat until smooth. Stir in oats and cereal. Add flour, baking soda and salt; mix until well blended. Reserve 1 cup of mixture for topping; set aside. Press remaining mix into bottom of pan. Bake at 350 degrees for 10 minutes. Meanwhile, in small pan on stove, heat caramels and milk over low heat, stirring constantly until melted and smooth. Remove partially baked crust from oven. Sprinkle with 1 cup of candy-coated chocolate pieces. Drizzle with melted caramel, avoiding the sides of pan.Drop reserved oat mixture by heaping spoonfuls over the top. Sprinkle with remaining chocolate pieces. Return to oven. Bake 20-25 minutes or until center is set and top is golden brown. Cool 1 hour. I wish you the happiest of holidays filled with love, laughter and delicious sweet treats in moderation (like these caramel candy bar cookies). Happy Holidays! This post is in partnership with Oriental Trading Company. Ideas and opinions my own. 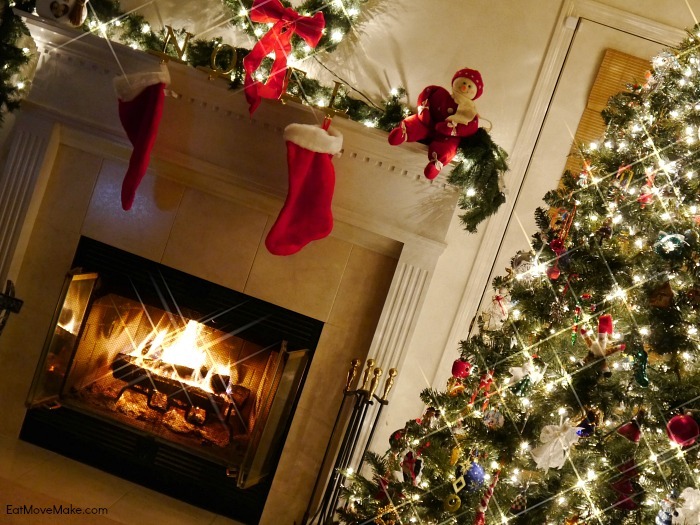 Now that Thanksgiving is over, we’re free to decorate for Christmas as we please! Wheeee! I haven’t decorated for Christmas in a few years so this project was verrrryyy exciting for me to work on. Since I no longer have any of my old holiday decor, I was starting from scratch for this project and wanted to decorate a space that wouldn’t overwhelm me too much. That’s why I picked my dining table – there’s a limited amount of space to work with and hopefully no chance of decor burnout! 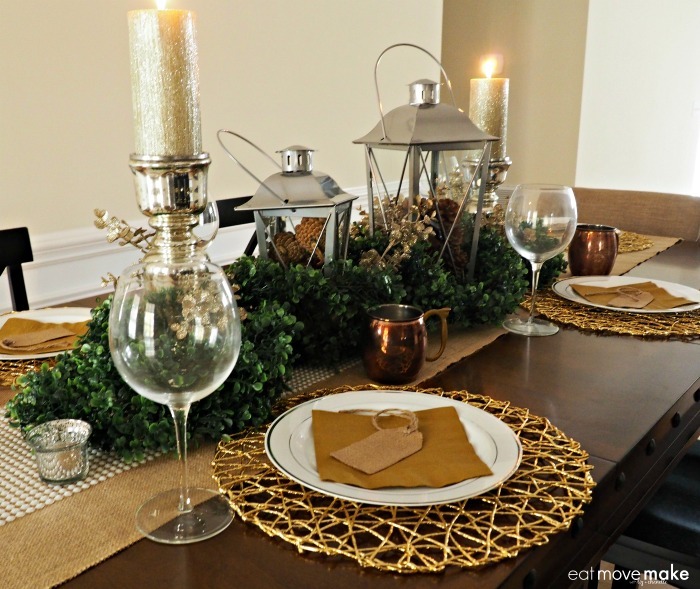 When it comes to holiday decor, my style tends toward the silver and gold side rather than the red and green side, so I wanted to bring that theme into this tablescape. 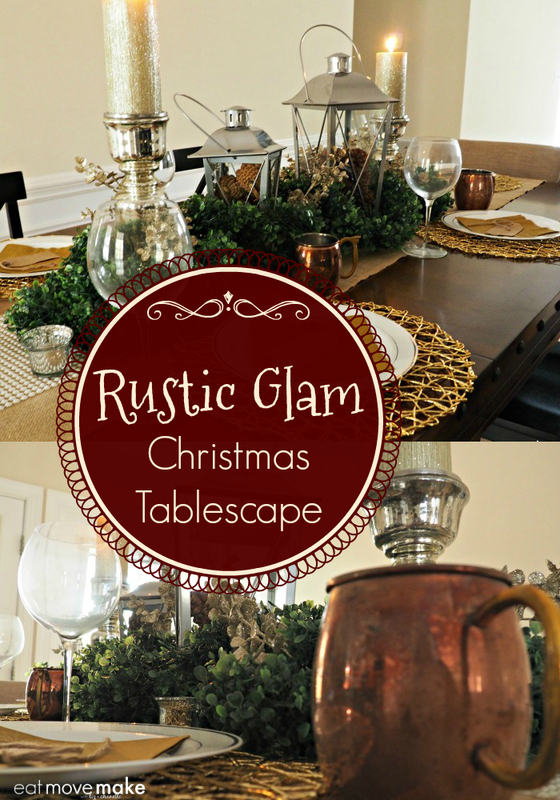 I decided to create a “rustic glam” Christmas tablescape with metallics, sparkles, and a little greenery. 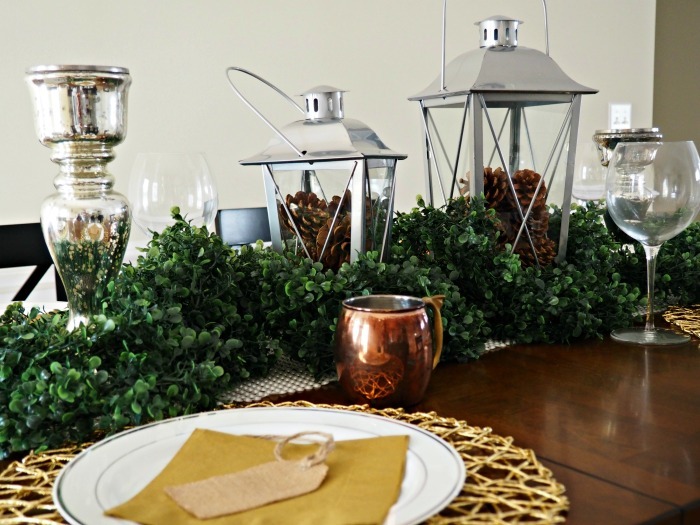 When I was shopping the Oriental Trading website, I planned out (for the most part) the tablescape in my head. That way, once I received my items in the mail, I had a good general idea of where I wanted to place everything. Once I had laid down the pearl table runner, I started with the biggest items – the silver lanterns and the mercury glass candlesticks. I staggered them so that they alternated between tall and short. I filled the lanterns with two packages of pinecones (about 70% went to the large lantern and 30% to the small one). 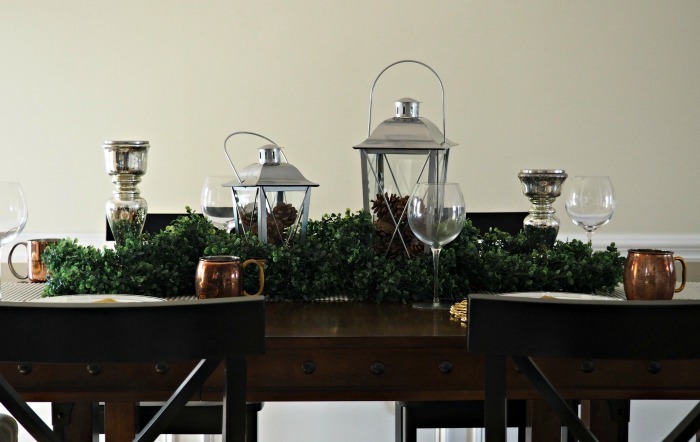 Then I wove two boxwood garlands around the lanterns and candlesticks, making the garlands look as fluffy and full as possible. 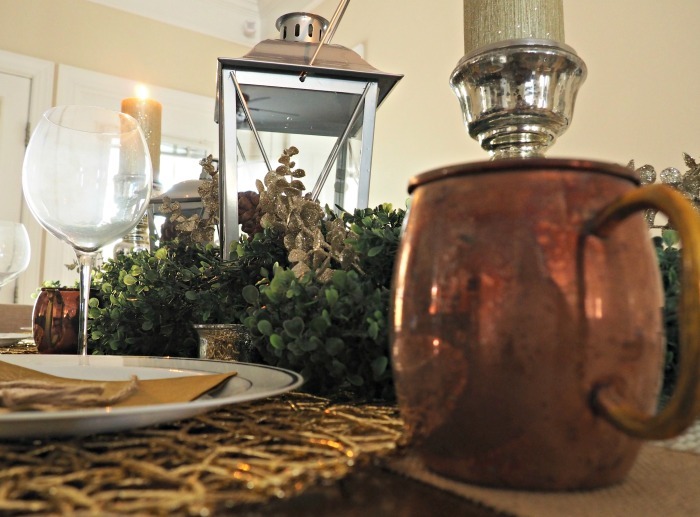 For the place settings, aside from the copper mugs and wine glasses I placed a gold woven runner underneath white plates with silver trim. You might notice that I also decided to add a burlap runner underneath the pearl runner for more texture. I also wove some sparkly gold floral picks into the garland and added gold pillar candles to the candlesticks. I’m so happy with how my tablescape came out! Even my boyfriend, who doesn’t really care about decor – especially holiday decor – loved it and told me to leave it up for the season! I love how versatile this look is. If you remove the sparkly picks and replace the gold pillars with white ones, this would work throughout the fall. As is, I think it would look great for Christmas all the way through New Year’s. 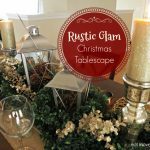 I hope my rustic glam Christmas tablescape shows you that you can create a glamorous, festive holiday look without shopping at expensive stores – all you need is some creativity and the willingness to experiment with layering colors and textures until you land on the perfect look! 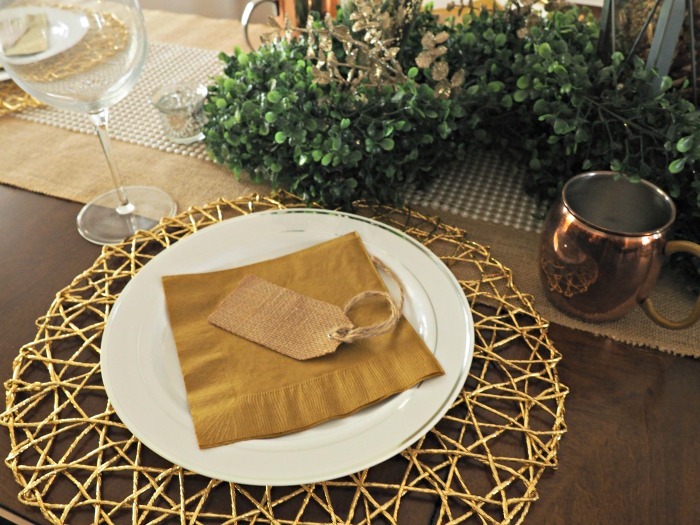 You can find the pieces I used in my tablescape at Oriental Trading! Click here to shop their Christmas section. And because I’m feeling jolly, here’s a list of the exact pieces I used! 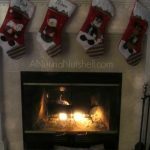 ‘Tis the season of holiday traditions, and I love the memories and warm feelings those traditions bring! I’ve always been the tradition keeper in my home, and my kids still expect certain things to remain exactly the same year in, year out. At our house, holiday traditions begin the day after Thanksgiving, when we decorate the house and put up the Christmas tree. We love to play Christmas music while we hang the hundreds of ornaments I’ve collected over the years. I might have a bit of an ornament obsession. Once the tree is up, we have a candy cane hunt! I buy two dozen candy canes, and then hide them around the house. The kids search them out, and then hang them on the tree. They’re allowed to eat no more than one per day, so sometimes by Christmas day there aren’t any candy canes left. But that’s the idea! It’s best to enjoy those candy canes during the season. On Christmas Eve, we pile into the car with hot cocoa, and drive around looking at all the Christmas lights. 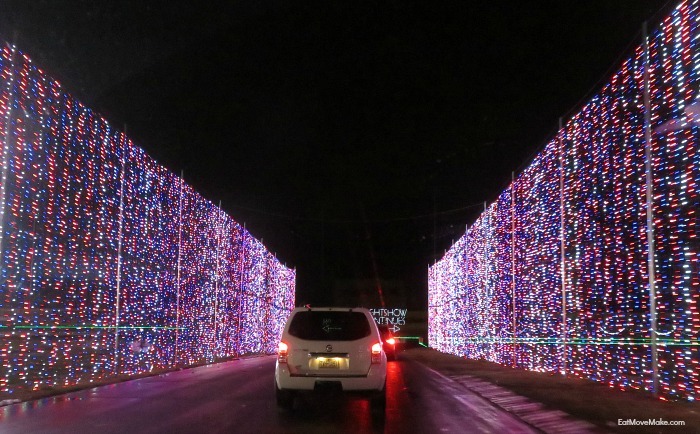 Sometimes we go through neighborhoods, and sometimes we visit special drive-through holiday light shows. It’s such a magical tradition! Of course, food is a major part of everyone’s holiday traditions, right? While I don’t usually leave munchies out, the holidays are different. 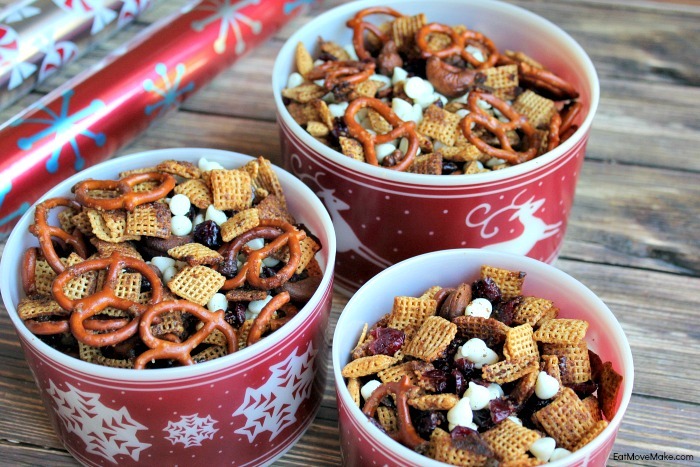 I love to put out a bowl of nuts with a nutcracker, fill candy dishes with favorite treats, and have a nice big container of Chex snack mix on hand. ‘Tis the season for snacking! 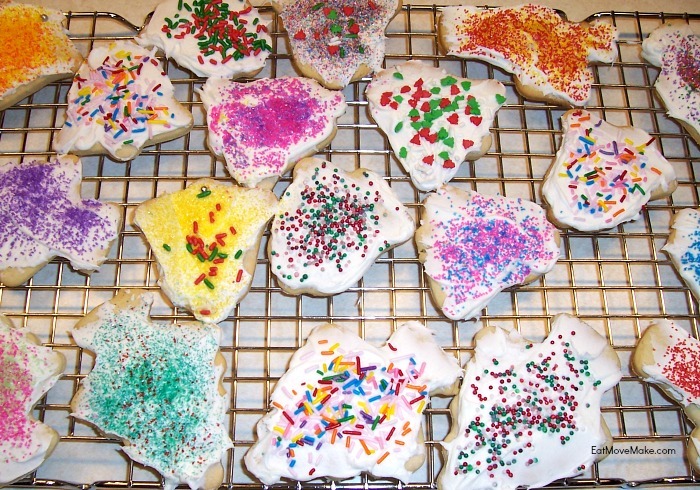 Of course, there are also lots of freshly baked cookies around, and the cut-out cookies are the family favorite. The recipe comes from an old Betty Crocker cookbook my mom gave me. It doesn’t even have a cover on it anymore, but I can’t give it up! I’d love to hear about your holiday traditions, and so would General Mills. For 150 years, the family of brands, including Pillsbury, Betty Crocker and Chex, has been a part of the beloved food and holiday traditions that we all hold so dear. This year, the company wants to celebrate the people who make the season special. We all have someone close to us who inspires and keeps traditions alive, right? I encourage you to share your nostalgic holiday photos and any stories you have that celebrate your special tradition keepers. Please share those photos and stories on Twitter and Instagram with #HolidayTraditions, and each time you share, you’ll be entered to win my giveaway! 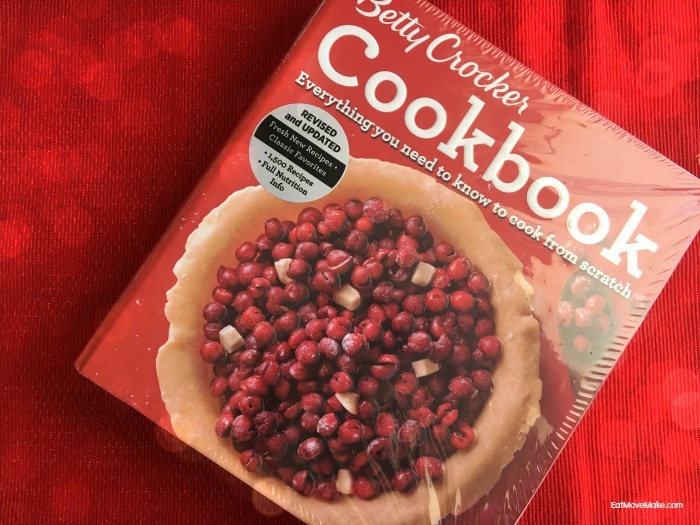 One (1) lucky reader receives a Betty Crocker Big Red Cookbook and a $25 Visa gift card! To enter, share your holiday photos and stories featuring food, family and fun on Twitter and Instagram using #HolidayTraditions. You can share every day, and for each one you’ll receive another entry! Want to see what everyone else has been sharing? Take a look! Compensation was provided by General Mills. The opinions are my own. I’m sharing Denny’s seasonal menu as part of a sponsored ambassadorship for Denny’s Diners. All opinions are my own. 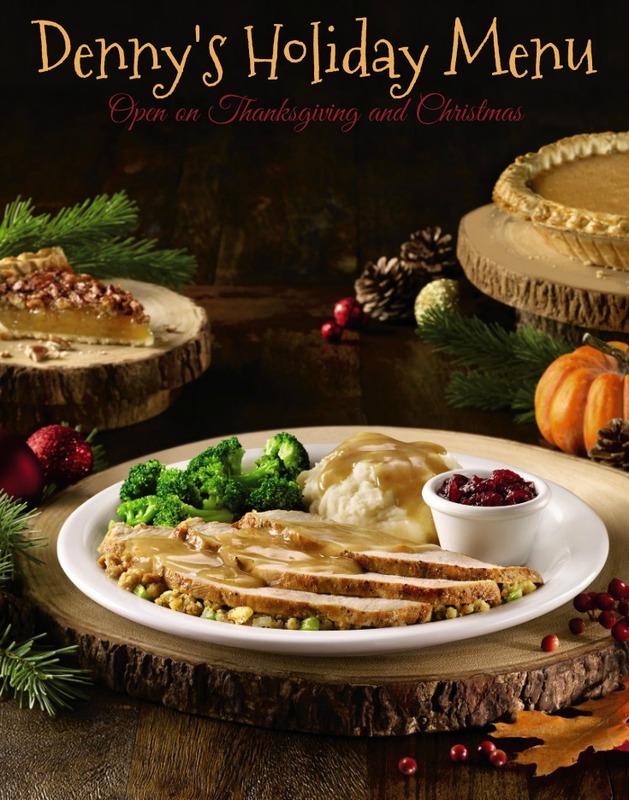 Did you know Denny’s is open on Thanksgiving and Christmas? YES! If you’re on the road for the holidays, and need an affordable seasonal meal for the family, stop at Denny’s. You’ll find traditional favorites like the popular Turkey & Dressing Dinner. 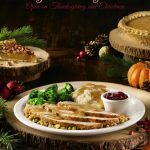 It features a tasty new recipe with perfectly carved slices of premium turkey breast served with savory stuffing, turkey gravy and cranberry sauce along with a choice of two sides and dinner bread. But there are also festive pancake flavors you’ll love. Through January 4th, you can have your pancakes drizzled, sprinkled, topped or infused with the festive flavors of pumpkin, pecan or caramel! New Pumpkin Cream Pancake Breakfast– Offering fall flavors with every bite, two fluffy pumpkin pancakes are layered and topped with tasty pumpkin cream and served with two eggs and hash browns, plus a choice of two strips of bacon or sausage links. New Sticky Bun Pancake Breakfast– Sinfully sweet cinnamon sauce and cream cheese icing are drizzled over two fluffy buttermilk pancakes with glazed pecans cooked inside, served with two eggs and hash browns, plus a choice of two strips of bacon or sausage links. New Salted Caramel & Banana Cream Pancake Breakfast– This delicious seasonal dish features two fluffy buttermilk pancakes with shortbread pieces cooked inside, layered with vanilla cream and topped with fresh bananas, warm salted caramel sauce and even more shortbread pieces. Served with two eggs and hash browns, plus a choice of two strips of bacon or sausage links. Be sure to bring the kids too! 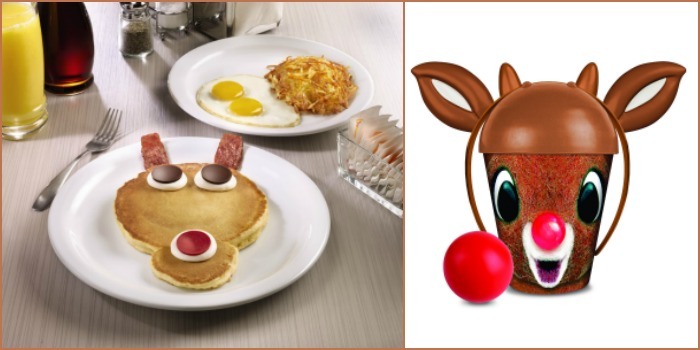 They’ll adore the the New Rudolph Pancake Breakfast and Rudolph kids cup! Have a sweet tooth? 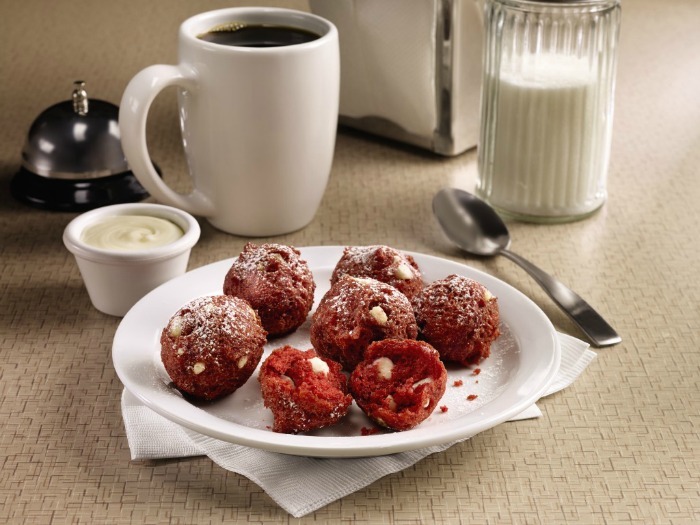 Don’t miss the Red Velvet Pancake Puppies, made with white chocolate chips, tossed with powdered sugar and served with a side of cream cheese icing for dipping. 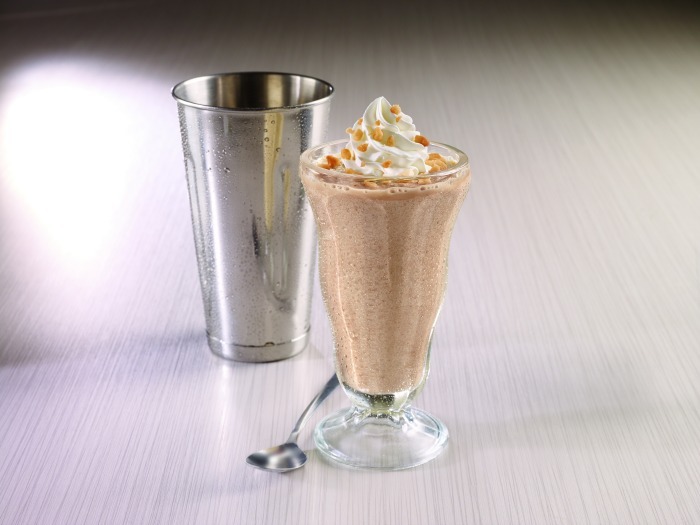 Or maybe you’d enjoy the new Holiday Cookie Milk Shake, made with premium vanilla ice cream which is blended with cookie butter, then topped with whipped cream and shortbread pieces. To enjoy the limited edition Denny’s seasonal menu, be sure to visit by January 4th! Find a Denny’s location near you. 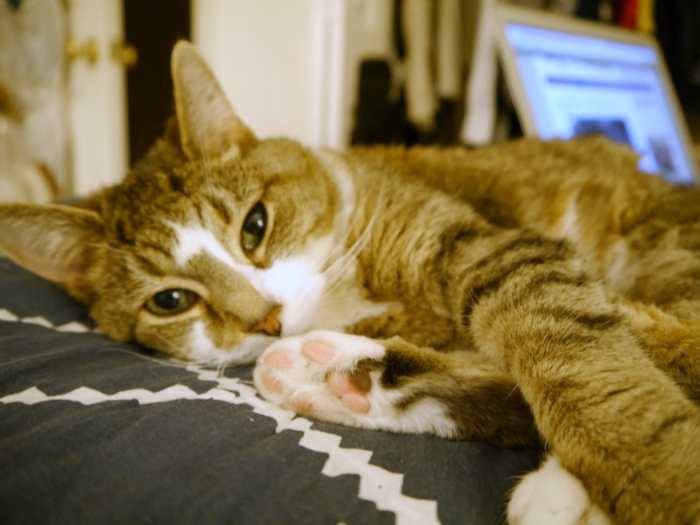 Whenever my cat’s bean toes are showing, I snap a photo because it’s so damn cute. So I thought I’d take it one step further and make a paw print ornament so I can remember how cute she is for all my Christmases to come! If you think Mony’s cute and want to see some more pics and a video, check out this recent post about a cat toy (which would be a perfect stocking stuffer for your kitty). 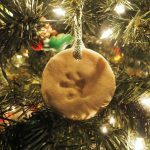 I chose to use salt dough for my paw print ornament. It’s really easy to make and will make four good-sized ornaments. Mix flour, salt, and water in a bowl. The result should be a Play-Doh-like consistency – you may need to add a little water if the dough is crumbly. On a floured surface, pat the dough into an even layer about 1/2 thick. Cut out ornament shapes with a glass. Press your pet’s paw into the ornament, then punch a hole at the top with a straw. Place ornaments on baking sheet covered with foil and bake for 2-3 hours (until dry). If necessary, file the edges to smooth them out. I used a nail file. 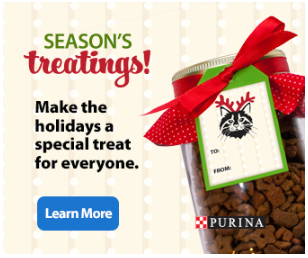 You can find this and other DIY ideas like printable pet gift tags and Mason treat jars on the Purina Holiday page at Walmart.com, along with $9 worth of coupons for pet items! 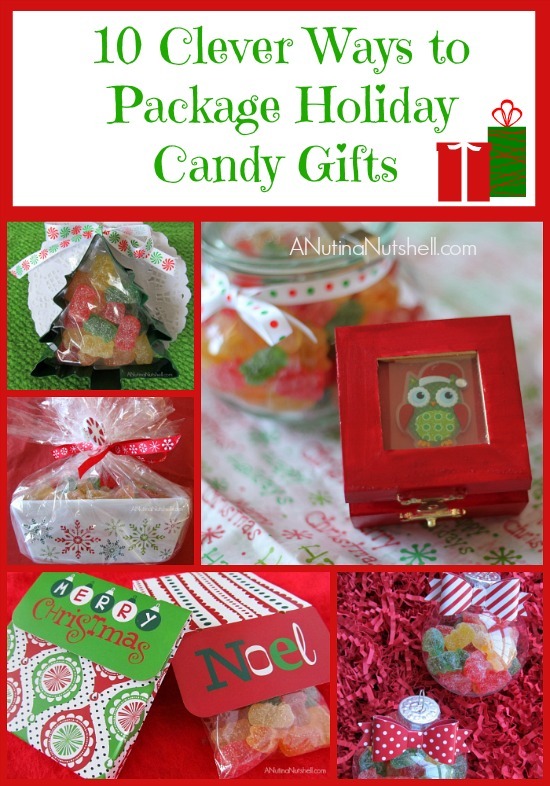 I love to think of fun ways to package holiday candy gifts for my kids, family and friends. It’s simple, festive, fun and oh, so tasty! Glue a doily onto sturdy cardboard backing. 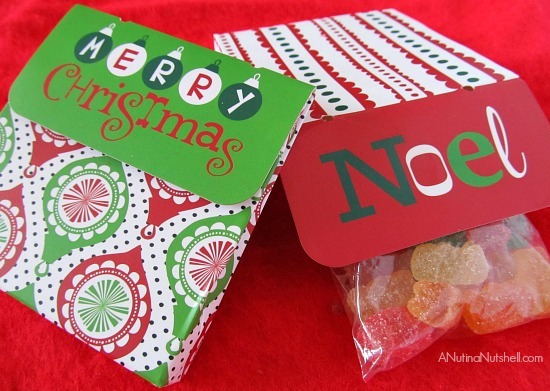 Fill a small treat bag with candy, tuck it inside a cute holiday-themed cookie cutter and tape or glue to doily. To finish, add a pretty ribbon on top. These are easy to find at holiday time, and they only cost me 50 cents each. After the candy is gone, they’re super cute for storing post-it notes. 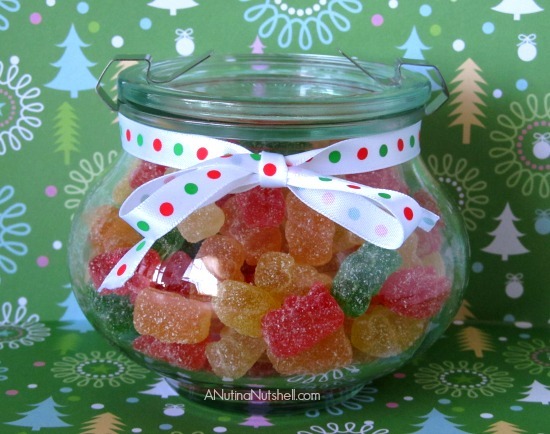 Fill a decorative candy jar and tie a pretty ribbon around it. 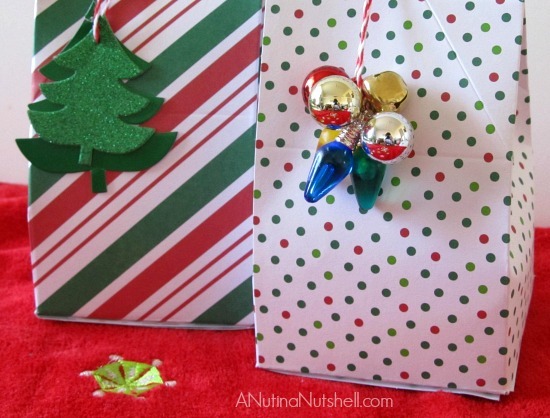 Look for colorful boxes or bags, and then add holiday die-cuts or notions to the front. 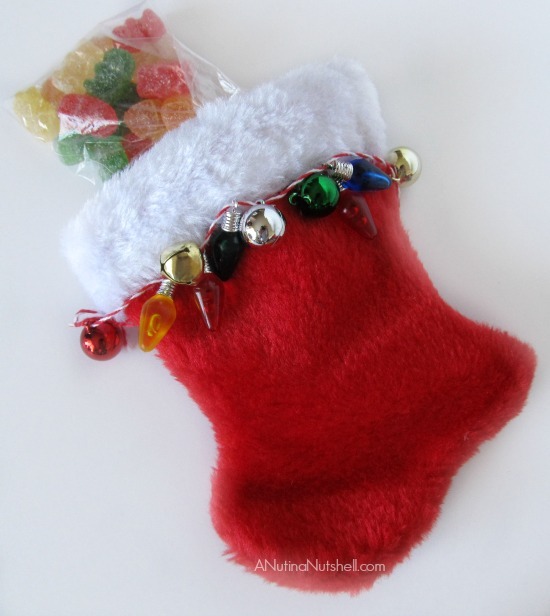 Slip your sweets inside a mini stocking, and dangle some tiny decorations from it to dress it up. 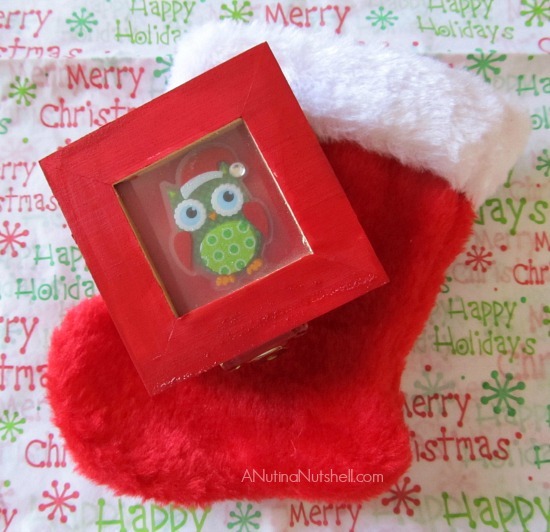 Paint a small hinged wooden box in festive colors, and add a cute holiday sticker to the top. Tuck your candy treats inside. 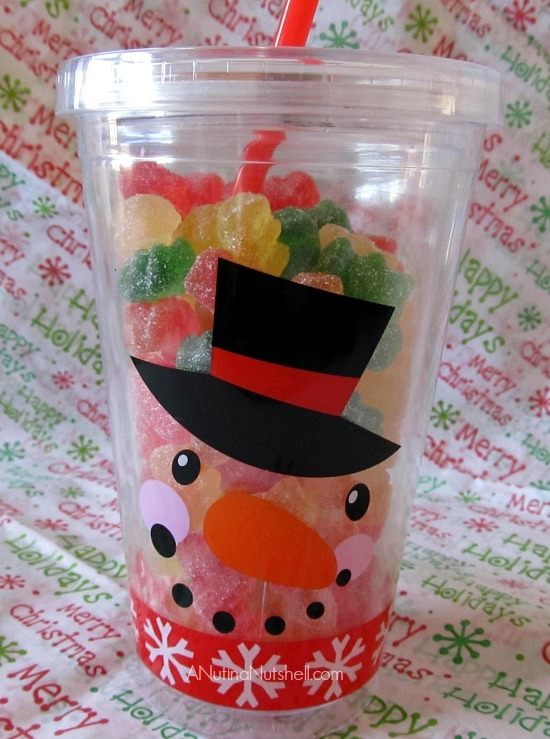 A candy-filled cup or mug is a classic favorite. 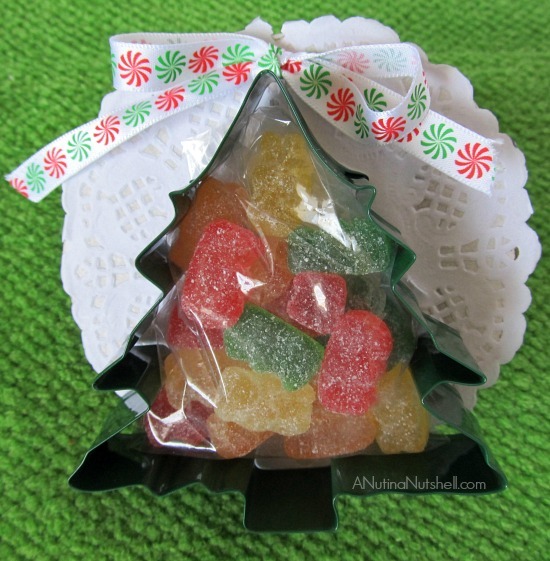 Fill clear plastic ornaments with colorful candy, and then either tie a pretty bow around the top or attach ribbon stickers. 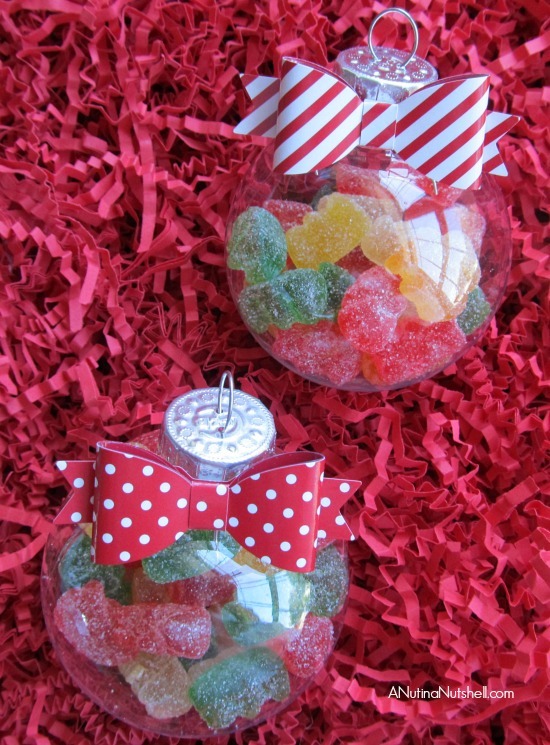 They can be hung on the tree or if you can’t resist the candy, go ahead and shake it out! 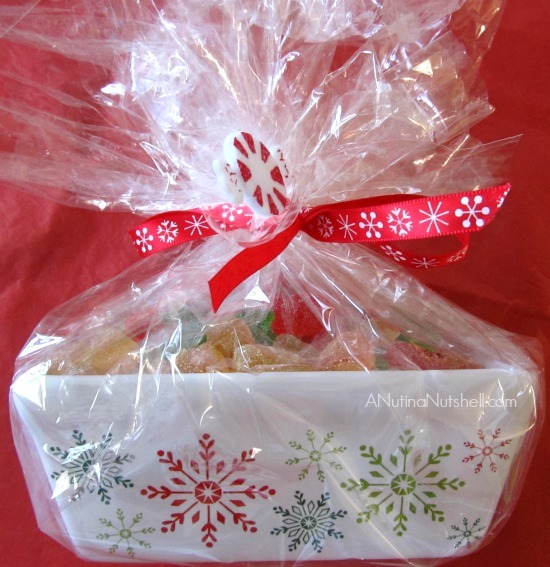 Fill a mini loaf pan, ramekin or pie dish with candy. Wrap it with cellophane and some holiday ribbon. 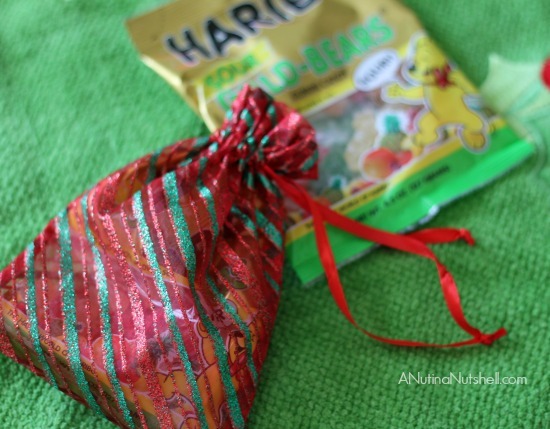 Choose a drawstring fabric bag in a fun holiday pattern and tuck a whole bag of candy inside! All of my ideas were created using Haribo Sour Gold-Bears. 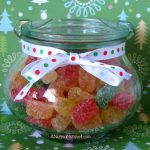 They’re brand new, and since so many people, including my kids and I, love sour gummies, they make a perfect choice for a holiday candy gift. The original gummi bear found in signature gold bags across the country is announcing a new flavor roll-out: Haribo Sour Gold-Bears. Flavors include Pineapple (clear), Strawberry (green), Lemon (yellow), Orange (orange) and Raspberry (red)m and they taste fresh, fruity and uniquely sour – but not too sour. 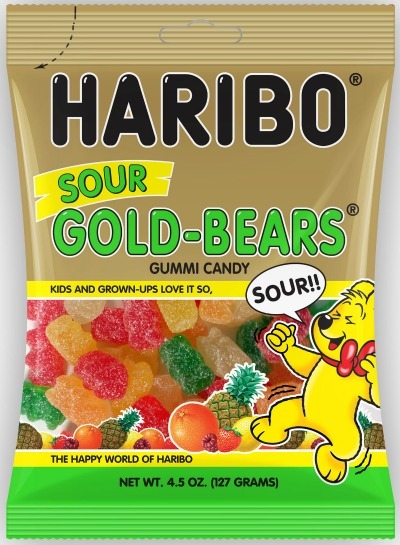 Haribo Sour Gold-Bears will hit U.S. shelves in 5-ounce bags this month at a suggested retail price of $1.09 – $1.69. For more information, visit www.haribo.com. Partnered post. All ideas and opinions are my own. With eyes shining brightly, the six of us kids would dash into the family room on Christmas morning. We’d squeal with delight as we spotted our personalized stockings, for they were filled with treasures from Santa! The stockings had our names on them, and were embellished with handmade miniature ornaments and candies. The letters on mine were the smallest of all six of us, since I had the longest name — Elizabeth. I could smell the Christmas turkey in the oven as I reached into my stocking to pull out my gifts, and one by one I marveled at them all. When I reached the toe, I knew I would find the juiciest, sweetest orange I could ever imagine, and I’d race to the kitchen to eat it as my special Christmas morning treat. Nothing will ever replace the cherished memories of my special childhood stocking, but I desperately wanted to order new stockings that would mimic the feeling and style of the one I hold so dear. 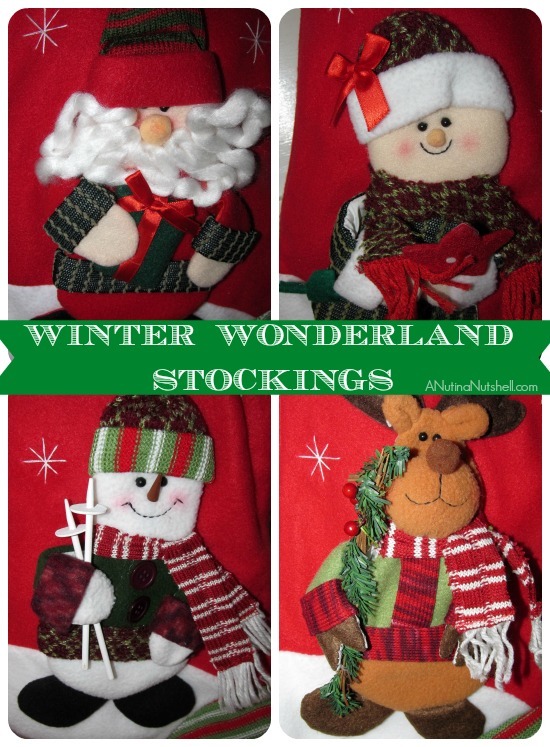 I spotted a selection of “Winter Wonderland” stockings at Personal Creations, and when I instantly got the warm fuzzies, I knew they were meant to be mine. They’re super soft and squishy, have dimension and texture, and they ooze warmth and comfort. I adore them. As you can tell, I’m sentimental, but I also have a fondness for whimsy. 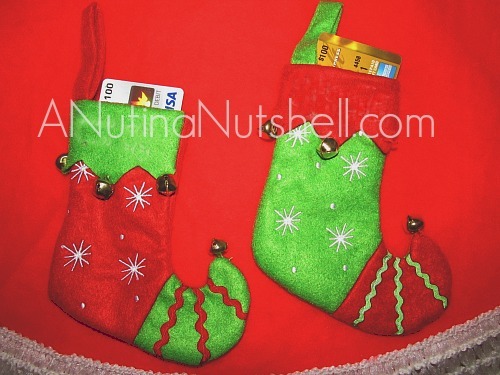 I personalized these jingle bell mini stocking gift card holders for my kids. The designs make me think of mischievous elves, and I love that! I have hundreds of ornaments, and my Christmas tree needs the entire year off just to prepare itself for the number of decorations I insist it hold for the entire month of December. However, in the last few years, I’ve really tried to be more selective in the ornaments I buy. 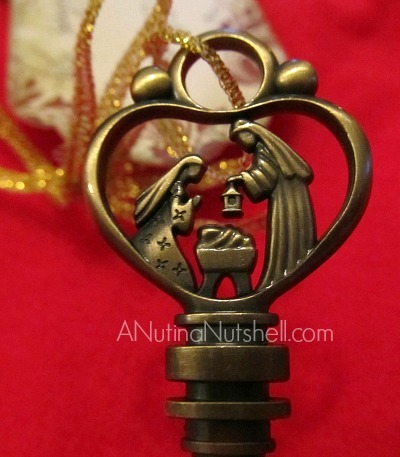 But when I saw “The Christmas Key,” it was destiny. It just had to be my 2013 ornament. In fact, I liked it so much that I ordered one for my mom as well. 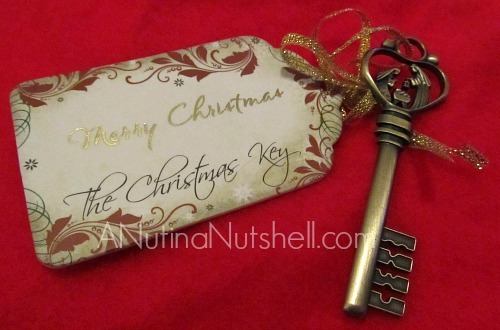 It comes with a little message to Santa that talks about the key to Christmas being Jesus, and it makes me smile that this ornament brings the two sides of Christmas together. Love. I hope you enjoyed sharing my Christmas memories with me, and perhaps you’ll find some personalized holiday magic yourself at Personal Creations. It’s certainly worth a look. Do you have special holiday stockings, ornaments or decor that gives you the warm fuzzies too? There’s no two ways about it: fruitcake is a food foul. It’s horrendous. 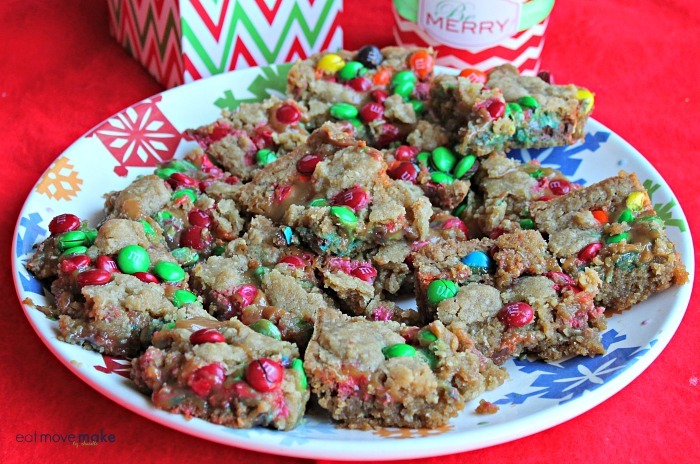 I wouldn’t be surprised if the origin of fruitcake could be traced back to the devil himself. So I made a fruitcake. Ha! But this is not the gummy brick-shaped lump of clay served by the devil’s kitchen staff. 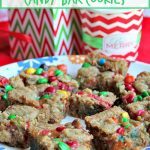 This is an old family recipe that turns the curse of the fruitcake on its bumble, and sets things right in the world again. 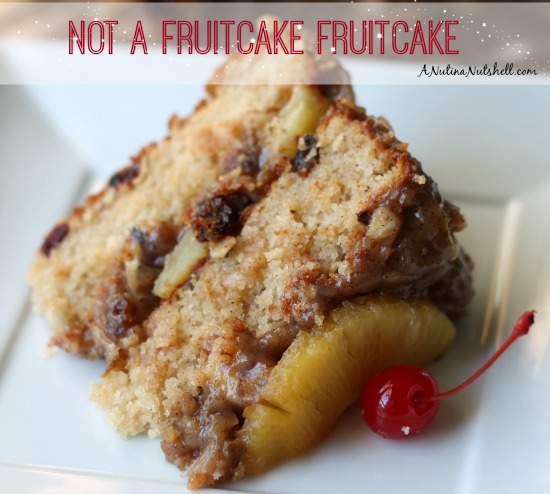 Introducing the… Not a Fruitcake Fruitcake. 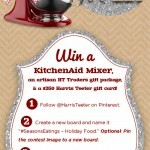 What inspired me is that Harris Teeter (one of my fave grocery stores here) is having a #SeasonsEatings Pin to Win contest on Pinterest, and they’re giving away some awesome prizes including a KitchenAid mixer! I just felt like getting into the spirit of things by baking a holiday recipe and creating my own Season’s Eatings board on Pinterest. 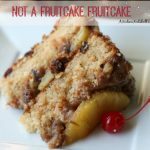 But first, here’s my recipe for a holiday dessert so good that it’s a shame it has the word fruitcake in its name! Preheat oven to 350 degrees. Grease and flour 2 round layer cake pan, but nonstick pans are preferable for this recipe. In small bowl toss dried fruits with 1Tbsp flour; set aside. Cream together butter and sugar. Add eggs; beat until smooth. Add jam, milk and vanilla; beat until smooth. In separate bowl, combine flour, baking powder and salt. Add to wet ingredients. Beat on medium speed until smooth. Fold in dried fruit mix. Pour equally into two round cake layer pans. Bake 30-40 minutes or until toothpick comes out clean. Cool in pans for 10 minutes; remove from pans onto cooling rack to cool completely. Lay out pineapple slices onto foil-covered baking sheet. Sprinkle with brown sugar and bake at 350 degrees for 20 minutes. Remove from oven; set aside. In large bowl, combine coconut, pecans and raisins; set aside. Blend sugar, flour and eggs in a mixer and then cook over medium heat until mixture reaches a boil, stirring constantly. Remove from heat and whisk in the cinnamon and cloves. Stir in the coconut, pecans and raisins. Refrigerate mixture for about 15 minutes. Decorate the cake top with the five remaining pineapple slices, placing a maraschino cherry into the center of each ring. 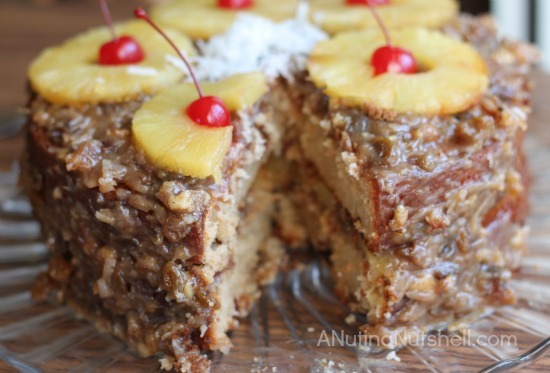 Add a touch of fruit or coconut to center of cake, if desired. Be sure to check out the Harris Teeter Season’s Eatings Pinterest contest!! Follow Harris Teeter on Pinterest too! One lucky reader will win a $25 Harris Teeter gift card. I received a gift card from Harris Teeter to buy recipe ingredients. The gift card featured in this giveaway is also provided by Harris Teeter. I have not been compensated for this post in any other way. It’s officially the season, and many of us are starting to think about the gifts we’d like to give our family and friends. 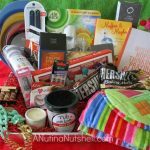 So, this year I’ve gathered together some of my favorite things to share with you as gift giving inspiration and as a giveaway! But not just me… I’m partnering with a great group of my fabulous blog friends and we’re all doing it. You’ll find gift giving ideas from each of us along with the chance to win “Our Favorite Things”. 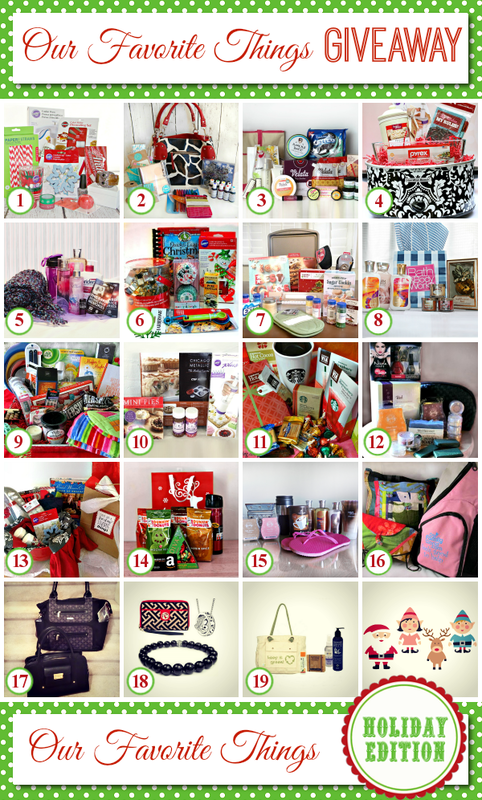 Browse the gift collage to see all the giveaways you can enter! Scroll down to see everything included in MY giveaway. 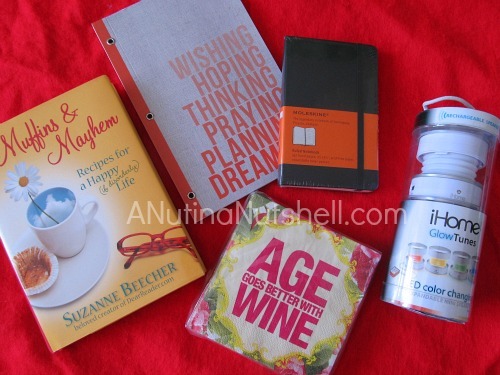 Enter to win My Favorite Things at the bottom of this post in the Giveaway Tools form. HOP around to all of the other sites for their gift ideas and giveaways. Let’s take a closer look at what’s inside! 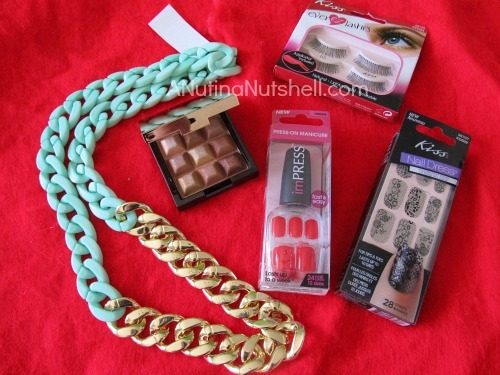 Eyelash kit, two nail press-on kits, makeup palette, super cute necklace I found at Nordstrom. Muffins & Mayhem (recipes & stories), notebook from Minted.com, napkins,moleskine notebook, iHome Glow Tunes speaker. 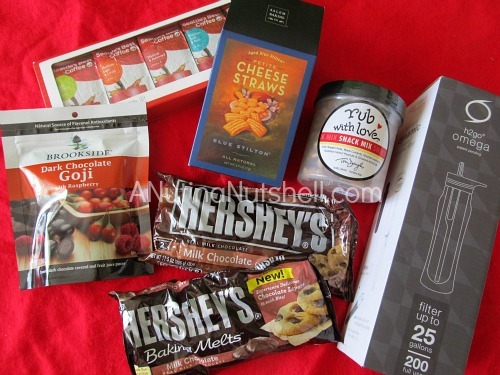 Seattle’s Best Tasting Kit, Brookside chocolate, Tom Douglas rub snack mix, Omega coconut water filter, Cheese straws, Hershey’s Baking Melts and Hershey’s Chocolate Chips. And those are just a few of my favorite things. 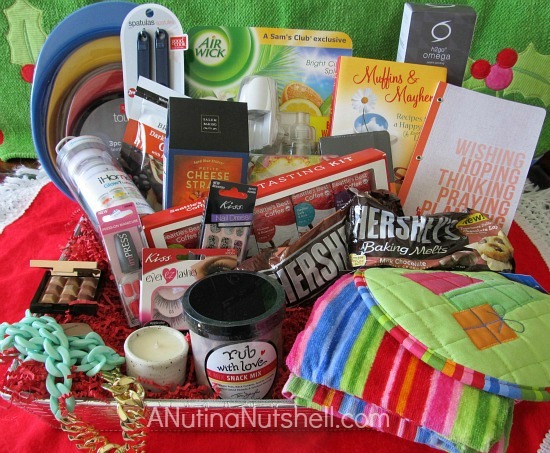 Please enter my giveaway for the chance to win it all!